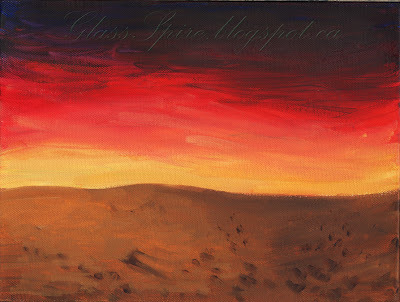 The Glass Spire: 24.08.13 - The missing artwork – has returned! The box canvas set of four is once again complete. These are all 12x9" oil paintings on 1" deep box canvas'. I scanned the one titled ‘Ruin’ again seeing as upon its arrival I realised that it is much darker than the quick photo I took of it all those years ago. Sadly its counterpart night scene below titled ‘Lake,’ got a little damaged in storage. You can see the two pock marks in the surface where something has pressed into the canvas and stretched it. If any fellow artists out there know a good fix for this type of canvas damage, I’d love to hear it! Lastly the desert/sun set landscape that I hoped to work into. 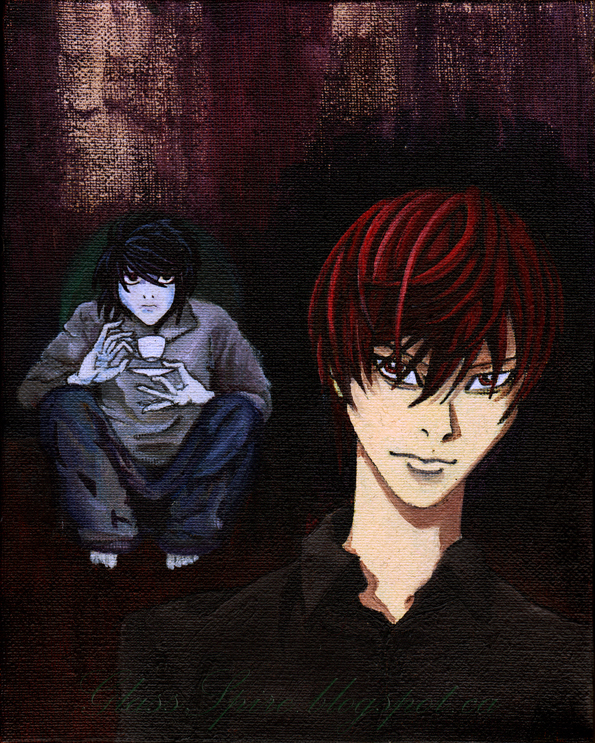 Also it seems there was one painting I forgot about created around 2008 or possibly 2009. Unfortunately I am notoriously bad at remembering to sign and/or date my work so I cannot pinpoint precisely when I decided to create the following piece of fan art. The only certainty is that I had obviously watched the anime Death Note by that point. It is an anime I love to this day, not for it’s animation but for the twists and turns of its story and small yet unforgettable cast of characters. Oh yes and Death Note knew when to quit, just about, unlike other anime that get forced to dredge and stretch over what feels like a lifetime to some utterly implausible and flimsy conclusion. This is the only painting I created whilst at university. 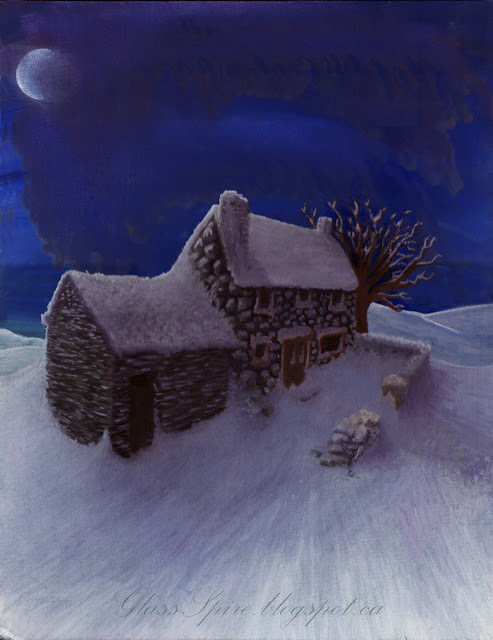 An 15.5 x 19" oil on canvas board titled ‘Snow Cottage,’ just to try and show my fellow team mates what I thought the house should look like in our film and to try and give them a sense of the snowy atmosphere. This is a patched together scan of the painting, due to its height and again as you can see, time has not been kind to the bottom left hand corner of the canvas. I am uncertain when the corner became damaged, seeing as ‘Snow Cottage,’ spent a lot of time travelling to and from university, then from Bournemouth to Northampton and now all the way to Canada! This would be the year of the infamous tiger and my mysterious ‘large’ painting that I failed to photograph. Well now I have finally taken a photograph, measured and titled that piece ‘Twisted Wood’, after um, how many years? 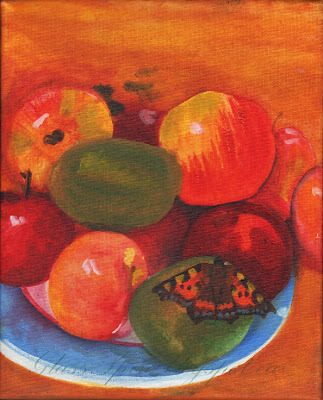 However another smaller painting that had slipped my mind from back then was this 8x10 oil on canvas, ‘Fruit Bowl.’ Personally, whilst I didn’t think much of it and was unsure if it was finished, I think folks liked this at the time because it was one of my first departures from painting in very dark shades. Ok now you get to see the woodland painting. 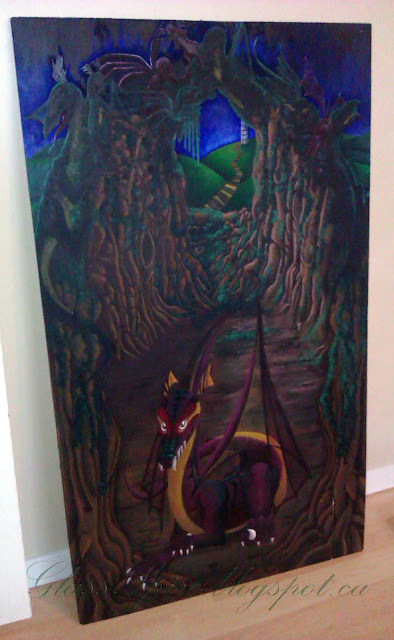 Still not the best quality photo but then this measures a whopping 53 x 31” and I only own a phone camera - go figure. Anyways I recall curling up next to the flat wood laid on the carpet of several houses whilst I worked on this – my poor knees! 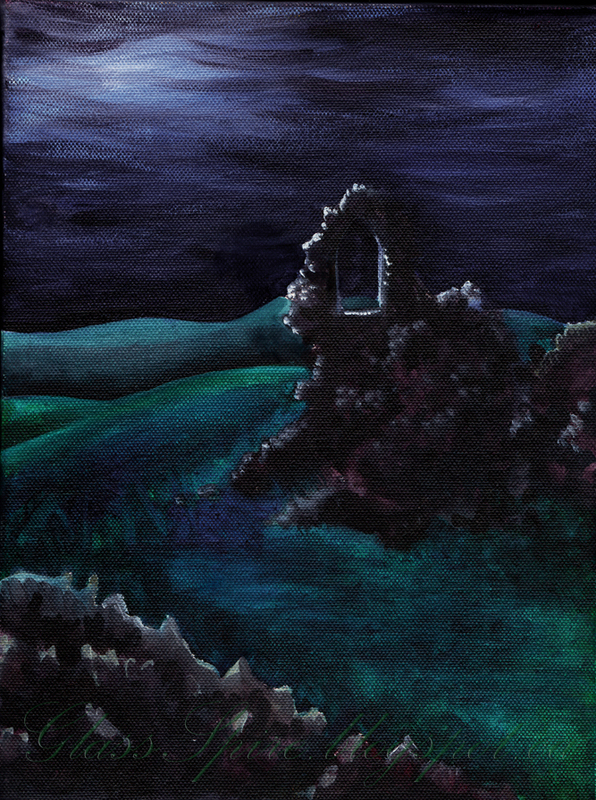 The spiral staircase (white blob to the right of the arch/at the top of the path) as I mentioned before was an homage to an older painting, the first painting I ever sold to be precise which was in itself created with reference to a vivid dream I had. As for the trees made of mannequins and dragon topped canopy, I was heavily into surrealist and illusionary works so painting something like this really fascinated me, enough to work on this painting over several years. Alongside ‘water tiger’ this painting has also lived in every single weird and wonderful house or room I have lived in (which is quite a lot I tell you!) spent time at a friend’s, around six months in the back of car for one reason or another and yet still emerged unscathed! 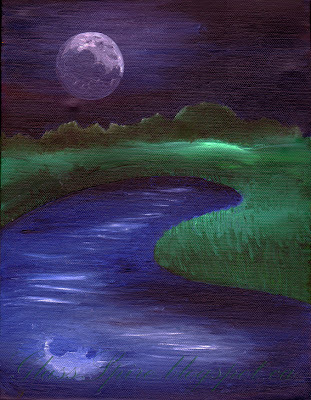 Way back in 2003 it seems I had attempted to create another painting involving water, although I will say I think I abandoned the below piece before it was complete. Perhaps I left it because I realised I had to learn more before I would be able to paint the water and reflections I imagined beneath the cabin. Again an untitled oil on canvas this piece measures 15.5 x 12". Sadly I never revisited this piece, but I guess by that time I had begun grander projects that simply interested me more. 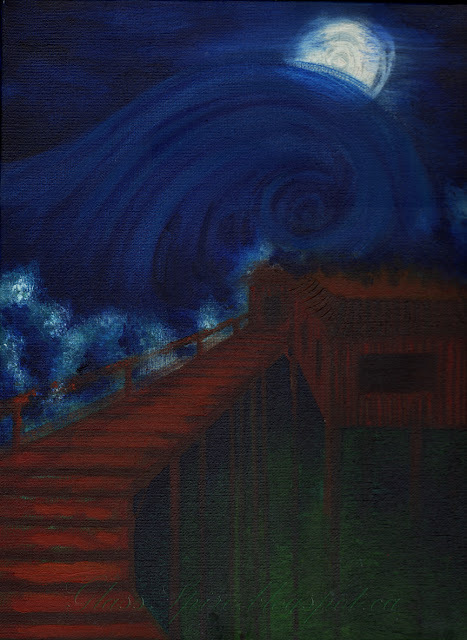 This measures 25" x 4.5" and was painted in gouache on wood from a dismantled drawer. The black line in the middle is obviously where the drawer panels split, waiting still to be glued in place. I’m going to assume I painted it between December and January by that, also I haven’t a clue why I would be using acrylic paint or where I might have gotten it from as I don’t recall ever using acrylics only oils and gouache! So there you have it, all present and correct, updated and finally reunited which makes for one happy artist!